Florida governor Rick Scott has shielded his assets from the public and, allegedly himself, by holding them in a blind trust that is managed by a financial adviser who has worked with the governor for decades. Will there be a trial over whether Gov. Rick Scott is violating the state's financial disclosure and blind trust laws and failing to disclose all the companies and investment he controls while governor? That is the question the First District Court of Appeal will now decide after oral arguments were heard in the case on Tuesday. Tallahassee attorney Don Hinkle filed the lawsuit last November, alleging that the governor is violating the intent of Florida's financial disclosure laws because he has failed to report all the assets that he controls in his partnerships and his wife's revocable trust. The claim also alleges that because Scott established a series of partnerships whose assets can't be sold without his knowledge, he is violating the blind trust law. But instead of having those claims heard at trial, the governor's lawyers have asked the appellate court to issue a "writ of prohibition" that says the trial court has no jurisdiction in the matter and Hinkle, a long-time contributor to Democratic candidates, has no standing to sue. If the appellate court agrees, a trial could be held before the November election. A multimillionaire and former hospital executive, Scott has shielded his assets from the public and, allegedly himself, by holding them in a blind trust that is managed by a financial adviser who has worked with the governor for decades. On Monday, Scott said he knows nothing about his investments, including the fact that in 2017 he and his family made as much as $550 million from the sale of a Michigan plastics company that Scott ran for five years before becoming governor. Hinkle not only casts doubts on the governor's claim, he argues that the list of assets the governor provided on his disclosure form is proof he is violating the blind trust law. 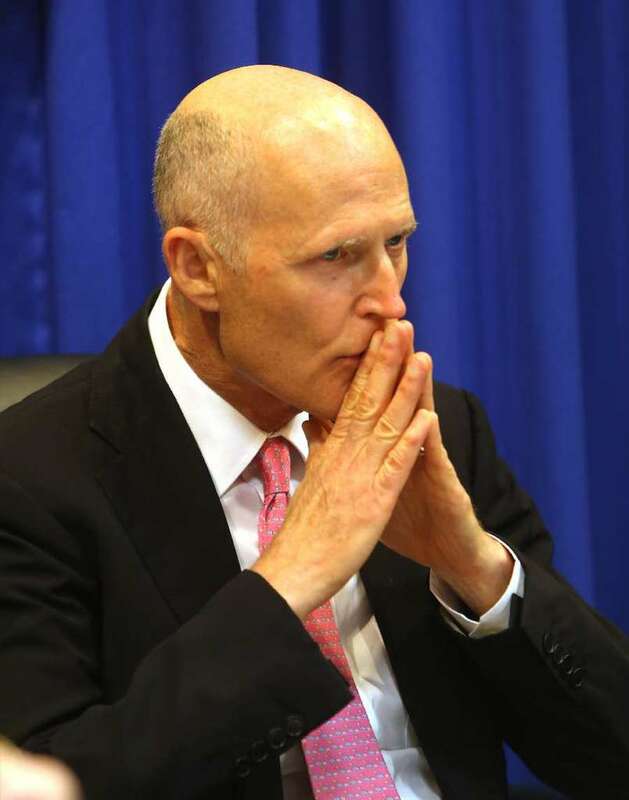 The assets "show that Governor Scott has many investments with restrictions on their transfer or sale, or in which transfer of the assets by the trustee would be 'improbable or impractical' without Governor Scott's knowledge,'' Hinkle argued. Because "such assets are not appropriate for a 'blind' trust,'' Hinkle claims the public has no way to know if Scott is separating his private holdings from his public policy decisions as governor. Dan Nordby, the governor's general counsel, counters that the Florida Commission on Ethics is the proper venue to bring a financial disclosure claim, and it has rejected Hinkle's claims three times. In April, Nordby asked Leon County Circuit Court Judge Karen Gievers to dismiss the case. She rejected the motion, so the governor's lawyers moved to have the Republican-dominated appellate court stop it. During a hearing Tuesday, judges Ross Bilbrey and Lori Rowe asked what remedy the public has if the Ethics Commission doesn't do its job. "What do you do if the Ethics Commission totally messes up the law,'' Bilbrey asked. "Does a complainant have no remedy whatsoever?" Nordby said the governor, the chief justice of the Supreme Court and the presiding officers of the Legislature can remove members of the Ethics Commission "but that's simply not the circumstance here." Hinkle countered that the Florida Constitution requires public officials to disclose their financial interests and, while the Ethics Commission can issue a fine, a reprimand or recommend impeachment for violating the law, it has no authority to order disclosure if a public official fails to do it. He said the trial court is the only remedy a citizen has to demand that the law is followed. Bilbrey asked if the legal challenge "may be moot" for Scott, a candidate for U.S. Senate, whose federal financial disclosure report is due on July 29. Unlike state law, federal law requires that Scott disclose all his wife's assets as well as his own. But Hinkle said the violation of law will remain and the public has a right to have it settled. Regardless of what Scott reports, Hinkle's lawsuit may have long-term implications. The precedent established by the ruling could play out if any of the millionaires now running for governor gets elected and creates a blind trust, as some have said they would. Hinkle said he filed the lawsuit because "it gnawed at me" that Scott filed his financial disclosure without including all the assets he controls and the Ethics Commission did not have the authority to ask him to revise it. "My contention isn't that you can't have a blind trust. My contention is if you do it, you have to do it right and this isn't done right,'' Hinkle told reporters after the hearing Tuesday. "This isn't blind. This is a sighted trust. There are assets outside the trust we know he controls, because he's sworn to the Securities and Exchange Commission that he's the sole person who can control investments in those trusts that aren't in his blind trust." He also noted that the trust in Scott's wife's name, the Frances Annette Scott revocable trust, mirrors many of the same assets Scott holds in his blind trust and "he's got things in his blind trust that cannot be sold without his knowledge." In 2017, for example, Scott earned $120 million more in income than the year before. A Times/Herald investigation found the governor and his family may have earned as much as $550 million from a single transaction, raising new questions about how blind Scott's blind trust really is. "The governor's assets don't fit within the trust,'' Hinkle said. "If all you owned were mutual funds or something, maybe you could put them in a blind trust and have someone else manage them. Those aren't the nature of his investments. His investments are in things that require active management and they can't be sold without his knowledge." The case is already generating some friction in the U.S. Senate race, in which Scott is attempting to unseat Democratic incumbent Sen. Bill Nelson. When asked by a reporter Tuesday how plausible it is that Scott did not know that he made $120 million in new income if he signed his tax return, Scott responded: "Whatever is on my tax return, I signed it." Scott's campaign staff later clarified that the governor has not yet filed his 2017 income tax but has asked for an extension. The Nelson campaign responded: "Rick Scott's been accused of filing misleading state financial disclosures; delaying the legally required disclosure to run for senate and now, it's been reported he's delayed filing his taxes — hiding a reported half-billion dollars that went to him and his business partners from a foreign conglomerate that he contacted on a trip paid for by Florida taxpayers." Hinkle had tried and failed three times to get the Florida Commission on Ethics to investigate the governor's financial disclosures. He wanted commissioners to investigate why Scott signed federal securities documents indicating he was the "beneficial owner" of assets in his wife's trust, but he didn't report them as assets on his own financial disclosure form. But the commission, some of whose members the governor appointed, dismissed the complaints without looking at Scott's trust and determining who controls Ann Scott's trust and without investigating the federal documents. "Our point is, someone should look into this and see,'' he said. "We have this conflict between what's filed in the Securities and Exchange Commission and what's in his financial disclosure in Florida." "It's important with respect to all public officials,'' Hinkle said, then referring to the Medicare fraud claims against Scott's former business, Columbia//HCA. "In this particular case, his last enterprise pled guilty to seven felonies. So maybe we should be able to check his homework here."